Week 7 Couples Share Choices: During week 7 couples share got to choose 7 of the 13 items available. We are so sorry, the 2019 Produce Shares are SOLD OUT. But, there are other options! 1) We will be at the Sisters Farmers Market on Sundays this summer! Pre buy market bucks here! 2) Make sure to get on our email list to learn about other weekly pickups! 3) We do have a 2019 Produce Share WAITLIST and may open shares up again in the middle of May after we determine how the crops are looking! 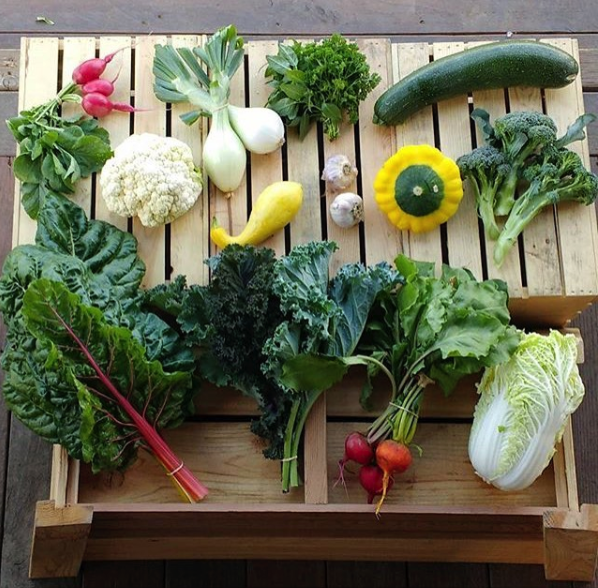 Sign Up For Produce Share Waitlist Here! If you are new to produce shares, or are just not quite sure how you can get through 15 lbs of produce in a week, this share is for you! This is ideal for 1-3 people, again dependent on your veggie consumption. This is an exciting option for us to be offering. What makes this share unique from all other shares in Central Oregon is you will be able to choose exactly what goes into your share each week! You will choose 6-7 items out of the 10-12 offered each week. YOU GET TO CHOOSE! This is really a unique offer- most farms do a bi-weekly share and do not allow people to choose the amounts they would like. But we want you to be able to eat the veggies exactly how you would like to. Subscribe and Reserve Your Spot Today! $50 deposit is due upon sign up. Two payment options include, one time or monthly. Full payment or first monthly payment due by March 15th. Auto pay option available. *For monthly payments you will only be charged the $50 deposit today. Monthly charges automatically will start on March 15th and will be taken on the 15th of every month for five months. *For one full payments you will only be charged the $50 deposit today. Please select the $50 deposit. You will then be sent an reminder to pay the remaining amount by March 15th. You can pay the full amount if you want today. You just have to do it in two transactions, first the deposit and then hit “subscribe” again below and select the full payment amount. The deposit is taken out of the full payment.